Not that long ago virtually all of us worked out of space in our home. As our profession evolved we began moving outside the house. We may still work by ourselves but just as often we are working with or for other people. The three most common types of work relationships for massage therapists are tenant, employee, and contractor. What sets these three relationships apart is the balance between control and responsibility: the more responsibility you have for something, the more you can exert control over it. The more control you have over something, the more responsibility you have to take for it. How does this control / responsibility balance work in each of these common working relationships? A landlord has the least amount of control over a tenant. A landlord can’t tell a tenant how do to their job, what hours to work, what to charge, etc. In balance, they have no responsibility for a tenant beyond making sure the space is usable. An employer has the greatest amount of control over an employee. The employer gets to define hours, location, standards, protocols, and policies. They take the most responsibility for the employee, ensuring they have the tools, space, and support they need to do their job. Contracting (specifically independent contracting) is in the complicated middle. The two parties have to negotiate the balance. What’s right or wrong is often decided as much by the IRS as it is by any other legal entity. One way to know if you are a tenant, employee, or a contractor is to look at the forms you fill out when you start working. If you signed a lease, you are a tenant. If you fill out a W4, you’re an employee. If you fill out a W9, you’re a contractor. Don’t work for someone who is vague or keeps changing their mind about whether you are an employee or contractor or tenant. You have to be one or the other. You can’t sorta be one and sorta be another. When you rent space, you’re a tenant. You can rent space two ways, usually. Standalone In A Commercial Space: You might rent an entire building for your business. You might rent a unit within a larger commercial building. You have a relationship with an owner who is very likely not a massage therapist and who may or may not have any experience with massage therapy. Standalone Inside Someone Else’s Business: You are running your massage practice inside a hair salon, yoga studio, gym, etc. You are a standalone independent business inside someone else’s business. When the place you’re working has the greatest amount of responsibility for you, they also get the greatest amount of control. The employer provides all the tools and space you need to do your work and finds the clients. They may pay you by the hour. If so, it will be less (often significantly less) than what the employer charges clients for an hour of your work. The employer may pay you by the session (split). You should receive more per session than you would per hour but you only get paid when you have clients. You may be paid a base rate plus a commission, though this is less common for massage therapists. The employer sets your schedule and can change your schedule. You may have to do work beyond massage therapy. Laundry, cleaning, answering the phones, etc. Unless the employer has more than 50 full-time employees they do not have to provide health insurance. They do not have to offer paid time off (sick, vacation, holidays, etc.). Most states have some version of “at will” employment — the employer can fire you or lay you off for any reason short of discrimination or retaliation. If you are fired and you believe you were fired for illegal reasons it’s your responsibility to take action. You may need to file a complaint with the Equal Employment Opportunity Commission and hire a lawyer. The benefit to employment is all the work you don’t have to do to run a business. Marketing. Laundry. Scheduling. Occupancy permits. Establishing and maintaining referral relationships. Buying (and repairing) equipment. Hours on the phone when the online scheduler goes wonky. As an employee you go into work, do your job, and go home. Independent contracting leaves the most things up for negotiation. Remember the balance of control and responsibility? The independent contractor relationship tests that balance more than any other relationship. The IRS has “common law rules” that help determine if an independent contractor relationship is legitimate or not. Behavioral: Does the contracting company try to control or have the right to control how you do massage? Financial: Are the business aspects of your job (payment, reimbursement, purchasing supplies, etc.) controlled by the contracting company? Type of Relationship: Do you have a written contract or employee type benefits (i.e. pension plan, insurance, vacation pay, etc.)? 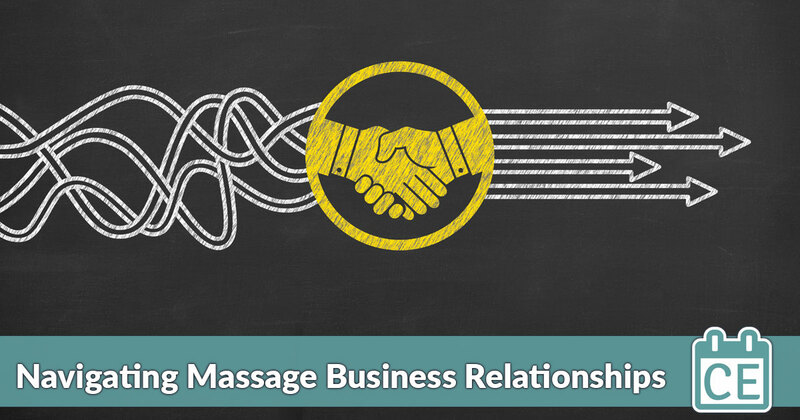 Is the relationship ongoing and (this is very important for massage therapy practices) is the work performed a key aspect of the business? When you are an independent contractor you are interacting with the contracting company as a business (a business of one, often, but still a business!). You are not interviewing for a job, your company is interviewing for a contract. You negotiate the contract. Your company should have its own standard contract (even when the other company already has their own standard contract). You can find dozens of examples of independent contractor contractors with a simple internet search. Your contract should have a start and end date even if you expect to be working for this company for a long term. That helps establish you as not-an-employee. It also gives you regular opportunities to update or modify the contract. To maintain your status as an independent contractor a single company cannot be the only place you do your work. You should at least be actively looking for additional work or other clients. The contracting company is not required to fill your schedule or guarantee you a minimum income. If the arrangement is not financially profitable you may need to sever the relationship, within the limits of your contract. Massage therapists sometimes complain that the contracting companies “make” them do things like attend meetings, do laundry, etc. This is literally not possible. The contracting company only has the authority defined within the contract. It is the responsibility of the independent contractor to say “no” when the answer is “no”. That is one of the responsibilities of being a business owner even when so many of us are heart-led and conflict-averse. Remember, the contracting company is not your boss, they’re your client. Conflict happens; it’s why a well-written contract is so important. The first place to go in the event of conflict with the contracting company is back to the contract. But when that’s not enough it’s up to you to stand up for yourself. Kelly Bowers has been a massage therapist since 2000. She has been teaching and writing about the business of massage since 2003. She is the author of “The Accidental Business Owner: A Friendly Guide to Success for Health and Wellness Practitioners” (published by Handspring Press in October 2018). She is co-author with Margo Bowman of “Can I Deduct That? 100 Things You Can (and maybe can’t) Take As Business Deductions”. She is the author of “Before You Leap: Six Secrets to Make Your Passion A Real Business” (currently being updated). She is also an NCBTMB-approved provider of continuing education. She lives and works in Durham NC.